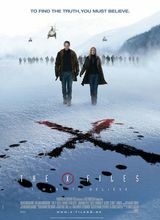 Continuation of the X-Files franchise's saga follows ex-FBI agents Mulder and Scully as they return to their employer to investigate a new paranormal occurrence. Ex-FBI agents Mulder and Scully, once renowned for their expertise investigating matters supernatural and paranormal, now live lives far removed from their old exploits, with Scully working as a physician in a hospital and Mulder wasting his days away as a gadfly waxing poetic about the weird to anyone who will listen. Things change for our ex-partners and lovers when a disgraced Catholic priest claims to be taken by visions of the whereabouts of a missing FBI agent, bringing the pair back on board to lend their talents and abilities to one last tough case.